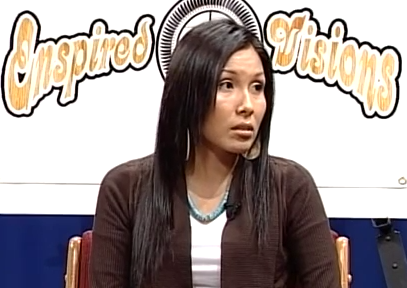 Cihuapilli Rose Amador and Sundust Martinez interviews Alexis Augustine (Navajo/Cochiti/Santo Domingo Pueblo) on Native Voice TV. Cihuapilli Rose Amador LeBeau (Yaqui/Mexica – HOST) and Craig Pasqua (Co-Host) interviews two guests: Lee R. Gardner (Navajo/Paiute; Job Developer and Coach) of Native TANF and Raymond Fiddler (Cheyenne/Sioux; Wood Craftsman) Mato Numpa Cedar Designs on Native Voice TV. Gardner gives an overview of the current Native ‘Temporary Assistance for Needy Families (Native – TANF) city and state locations and its TANF’s mission. TANF began by a Congressional Act of 1996. It gives ‘Federally Recognized Tribes’ the authority to independently design, adminster and operate their own Tribal ‘TANF’ programs. Gardner speaks of many of the Native people are having to move out of Santa Clara county due to high cost of living but in a positive light of how successes are also being lived by native people. The second guest of the show, Raymond Fiddler speaks about his company (Mato Numpa Cedar Designs) offering the community and across other states their hand crafted and ‘Lasered’ Designs on ‘American Red Cedar and Redwood’ boxes. Fiddler speaks his near death experience and how Native Traditional Healing saved his life. Fiddler speaks of his company working on ways to offer those who lost their family and friends ‘Monuments’.